"Titles that involve wordplay often send translators into overdrive." At this point, the teacher reminds him that the original German title, Wunschloses Unglück, has no “sorrow” in it: this “serious and strangely wonderful title,” a play on the phrase wunschlos glücklich (“happier than you could ever wish for” ), could be translated as “extreme unhappiness.” The student, without batting an eyelid, proceeds to explain what the author wanted to achieve with the book. The life and death of the central character, referred to as “she” or “my mother” throughout the book, are unexceptional: her story is typical for many women who lived in rural Austria between the 1920s and the 1970s. Born into a society where “a girl’s future was a joke,” she tried to defy conventions, leaving her village, learning new skills, and finding work. Happiness seemed possible at 18, and the Anschluss in 1938 brought with it the enthusiastic Nazi years that helped her become independent. The family lived hand to mouth, yet what killed human spirit was not poverty but the need to present it as “formally perfect squalor.” The mother took it all in her stride: hardship, drudgery, a drunkard husband, unwanted pregnancies, a woman’s obligations—until “gradually, in its daily effort to keep up appearances, her face lost its soul.” When life became less difficult, she began to read and take interest in politics, but the burst of vitality did not last, and soon depression came, followed by horrors: of death, of dark. 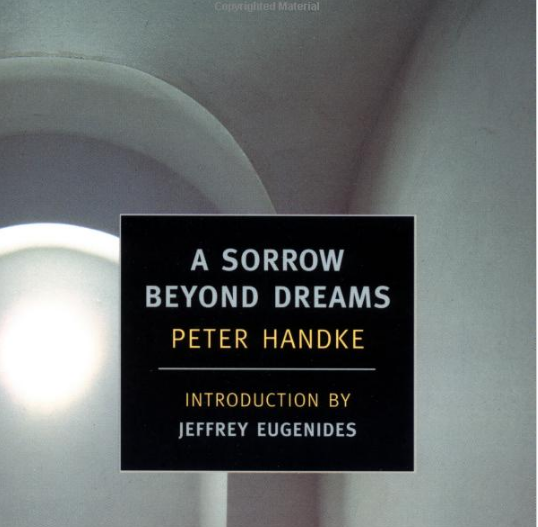 Handke appears to do little more than record dry facts, and yet he turns the story of his mother into a critique of her society. His radicalism manifests itself in language and style rather than in his direct involvement with social or political subjects. One example of this is capitalized words appearing throughout the text, clearly quotes, which tell us something about the people who are being quoted. Take, for instance, “VOLUNTARY DEATH” (FREITOD), a euphemism that replaced “suicide” (Selbstmord) at the time when the phenomenon was a social taboo. By drawing our attention to the term, the author makes us question whether his mother’s death really was “voluntary” rather than imposed. Elsewhere, “SETTLEMENTS for marriage” creates the atmosphere of patriarchal life, while “many ADMIRERS, kept at a DISTANCE” hints at the sexual mores of the epoch. Descriptions of Third Reich paraphernalia use the same device: “Buildings decorated with the new national emblem SALUTED.” The translation is sensitive to these features and produces the intended estrangement effect, turning the narrative into a commentary by means of equivalent formulae. Manheim’s discovery is as deep as Handke’s invention. Titles that involve wordplay often send translators into overdrive: they try to replicate the effect at all costs and even to outdo the author on the pun front. On first opening My Foot My Tutor, a 1969 play by Handke originally titled Das Mündel will Vormund sein, I thought it was one of those examples. Then I read the translator Michael Roloff’s note explaining that the title, literally “The ward wants to be warden” (in reference to the play’s two characters), is the accepted German translation of Prospero’s line that makes the English title. Anna Aslanyan is a journalist and translator. She writes for a number of publications, including 3:AM, the Independent, the LRB and the TLS—mainly about literature and arts. Her translations from Russian include Post-Post Soviet? Art, Politics and Society in Russia at the Turn of the Decade, a collection of essays edited by Ekaterina Degot (University of Chicago Press, 2013).